This unusual blackbird is attracting bird watchers to a Nottinghamshire country park. The bird is leucistic, which is a genetic mutation that prevents pigments from being deposited normally in its feathers. It has been residing for the last four years in the woodland of Rufford Abbey Country Park. Each year, observers say, it has steadily shed its black feathers for white feathers. Park rangers took this picture of the blackbird - which is now completely white with no visible pigmented feathers - in the summer of 2011. 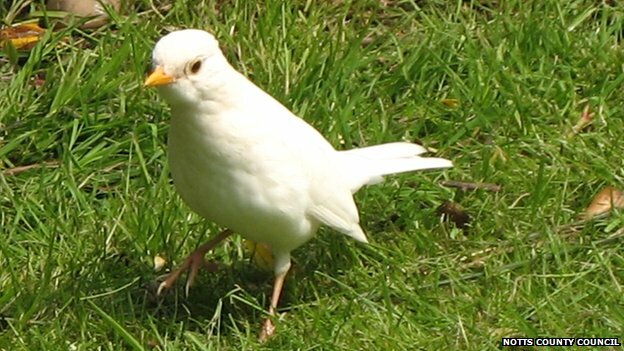 Leucistic birds are often very vulnerable to predators, because of their bright white plumage. So the park's managers are urging birdwatchers to keep an eye out for this unusual blackbird. Site manager John Clegg said: "This bird has been steadily turning whiter over the years and last summer it was completely white. "It has become quite a character at the park in recent years. "It tends to appear in the warmer months and we have not seen it for a few months but hope it will return here soon." Most leucistic birds have some spots or patches of colouration in their feathers from other pigments, so this is a particularly unusual specimen.